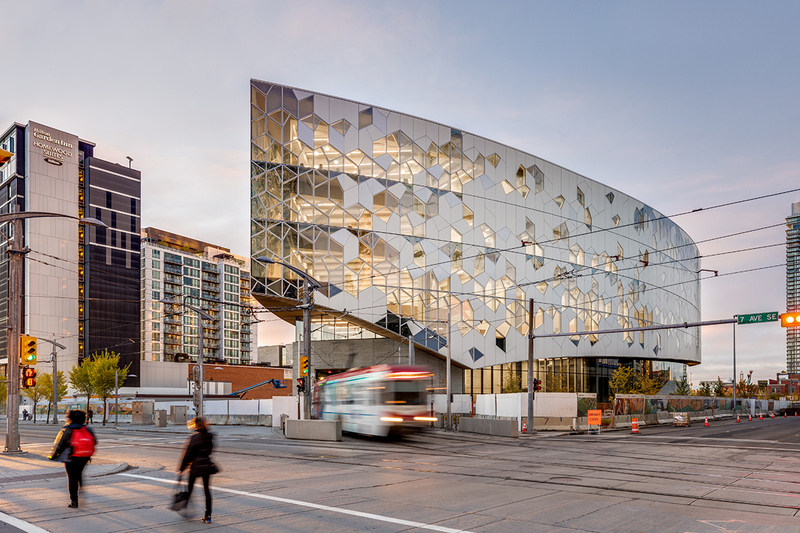 Named one of Architectural Digest’s 12 Most Anticipated Buildings of 2018, the New Central Library is one of Calgary’s most distinctive cultural institutions, with signature design led by renowned international architecture firm Snøhetta. 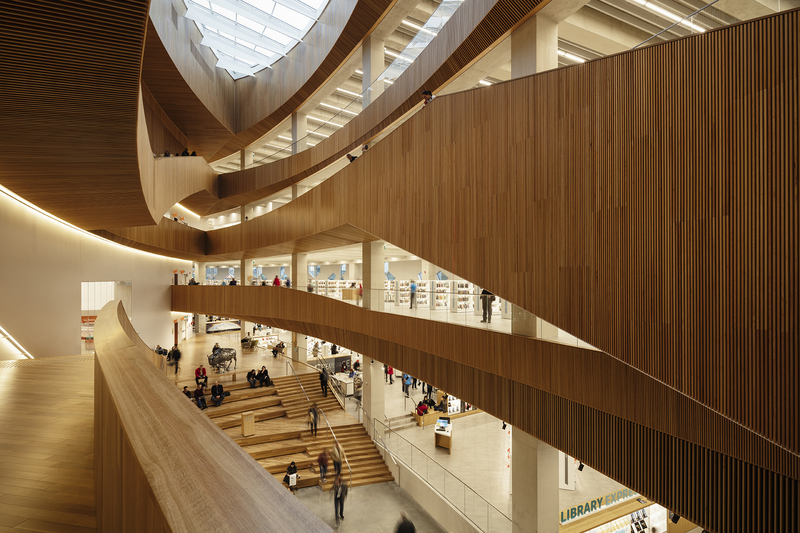 The library occupies 278,000 ft² and was built over Calgary’s busiest LRT line, which bisects and occupies approximately 40% of the site area. 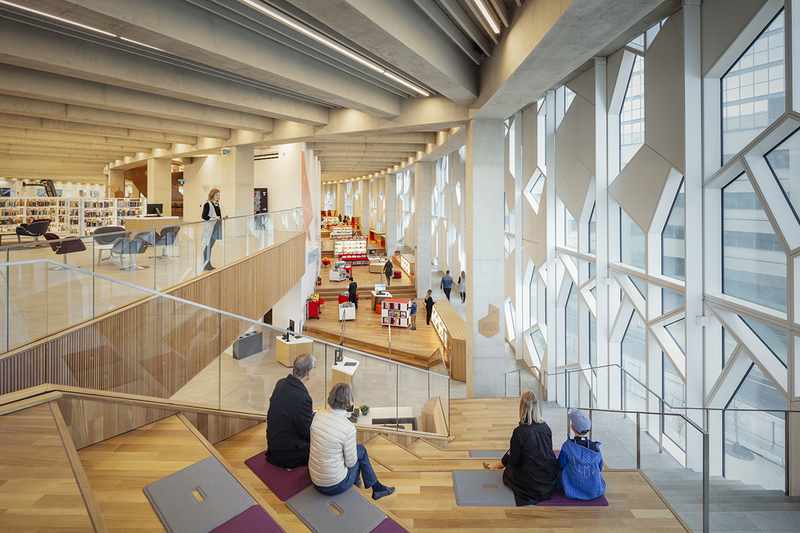 The library’s design emphasizes public accessibility and community-oriented spaces. Within three months of its opening, on November 1, 2018, the library saw more than half a million eager visitors. Entuitive was retained by Snøhetta and DIALOG, the executive architect, as structural engineering consultants to bring this prime example of transit-oriented development to life. Transit-oriented development involves integrating transit lines into new structures. Traditionally these two areas of the built environment remained separate, leaving valuable, potentially needed real estate untouched. Today, creative, collaborative, and advanced engineering allows us to merge the two realms, creating integrated, sustainable cities that work for communities. Transit-oriented spaces serve as a solution to climate change and energy security by creating walkable communities that reduce the reliance on cars and energy consumption. According to the Transit Oriented Development Institute, this kind of development can reduce the need for driving by up to 85%. The New Central Library is the first time in Calgary’s history that a building has been constructed directly overtop an active LRT line. An encapsulation structure, essentially an extension to the existing tunnel, had to be designed and constructed before the library building could be erected. The Calgary Municipal Land Corporation (CMLC), Calgary Public Library, and the City of Calgary were looking for a structural consultant that had experience with complex projects. But they also wanted to ensure that the day-to-day point person dealing with the project was the right fit and had the right mindset for a culturally significant project with a five-year design and construction schedule. Entuitive’s experience with large-scale, complex projects, as well as our preparation for the interview with the client secured this project. Our team anticipated client questions and fostered an open, amicable environment throughout the meeting. By staying true to our value of collaboration, we earned the opportunity to work on this incredible project. Our core values of being creative, collaborative, and advanced were aligned with what the client was looking for in a firm. Entuitive’s commitment to advanced technologies, such as parametric modeling and analysis software, also allowed us to quickly investigate multiple concepts for the design of the library. By working collaboratively with all stakeholders, outlining geometric constraints and design considerations, our team ensured the best solution for NCL.